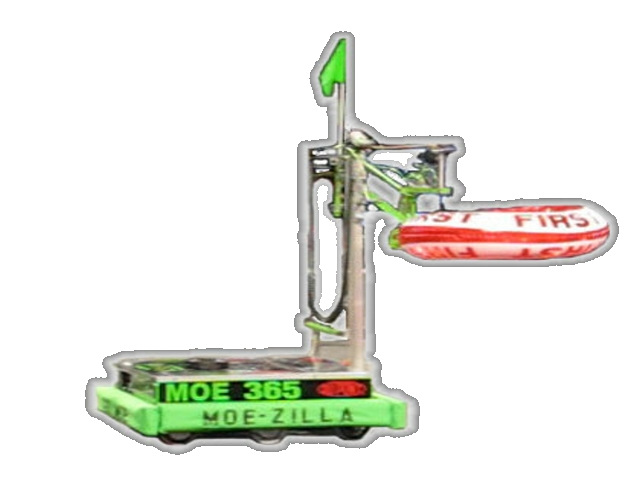 MOEzilla is a bright green and black robot designed to quickly hang tubes in autonomous and human control periods on all three spider leg levels. Ability to grab tubes off of floor, from chute , or over alliance station. Two-speed drive powered by 4 CIMs, high speed for fast traversing the field or low speed for pushing power. 6 wheel drive provides great maneuverability with good traction. Gripper can rotate around vertical arm ~180-degrees supporting tube placement from front and side rack positions. Can hang tubes on all spider leg levels. Climbs onto other robots with ramps. We have multiple autonomous routines from different robot starting position and can score a Keeper in autonomous in multiple locations.